Taylor Swift performed an emotional song on The Tonight Show during what was Jimmy Fallon’s first show since the death of his mum, Gloria. During the show, Taylor made an unplanned performance of the track, ‘New Years Day’, from her latest album, Reputation, and left everybody in tears. Fallon, who was reportedly with Gloria when she died on 4 November from an ‘undisclosed illness’, paid tribute to her during Monday night’s programme. When we were little, my mom would walk us to the store and we would hold hands and she would squeeze my hand three times and say ‘I love you’. Last week, I was in the hospital and I grabbed her hand and squeezed ‘I love you.’ I just knew we were in trouble. 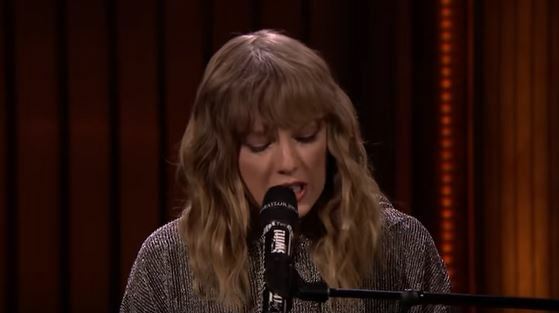 So when Taylor took to her piano to sing her song, which is about never leaving a loved one’s side, it ‘deeply resonated with Fallon’ writes Huffington Post. You squeeze my hand three times in the back of the taxi. I can tell that it’s gonna be a long road. First, a quick word about Taylor Swift. She was not scheduled to do our show today. But we wanted something special for this first show back, so we asked her on a complete whim, since she had been in town doing SNL. She said yes with zero hesitation. She sang ‘New Year’s Day’. No one had heard it. Suddenly she sings the line, ‘Squeeze my hand 3 times in the back of the taxi.’ I nearly gasped. Tears. I think everyone in the audience started sobbing. I could see Jimmy silhouetted at his desk dabbing his eyes with a tissue. We all lost it. It was a beautiful coincidence in a beautiful performance. ‘Hold on to your memories, they will hold on to you,’ Taylor sang. She sang "New Year's Day." No one had heard it. Suddenly she sings the line, "Squeeze my hand 3 times in the back of the taxi." I nearly gasped. Tears. I think everyone in the audience started sobbing. I could see Jimmy silhouetted at his desk dabbing his eyes with a tissue. We all lost it. It was a beautiful coincidence in a beautiful performance. "Hold on to your memories, they will hold on to you," Taylor sang.